Video calling is another benefit of taking on a VoIP telephone solution from Akita. We provide VoIP video calling and video conference functionality at no additional cost. 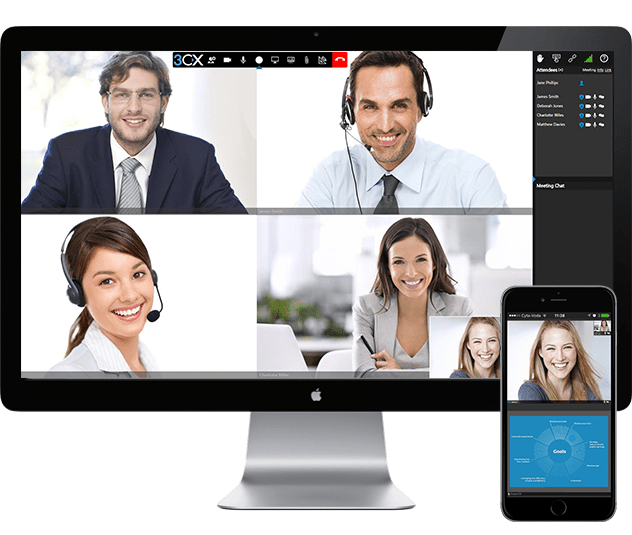 Video calling, using technology from our partner 3CX, introduces the benefit of face-to-face communication from the convenience of your laptop, desktop or mobile device. Video calls allow you to have more personal communications with key clients and better engage with colleagues in regional or overseas offices. They can also prove a more effective way of interacting. A survey from Gigaom found that 90% of those using video calls felt they were able to get their point across more easily than using audio-only calls. VoIP video calls can also ensure that remote workers are engaged and in touch with activities within offices, making them feel valued and increasing their productivity. Video conferencing enables businesses to save time and money by hosting meetings virtually. Using video conferencing, you can get all the required people together instantly without the need for travel. Video conferencing also helps improve productivity, with 89% of research participants stating that video conferencing had helped them to complete tasks and projects faster. Scalable – Host up to 50 participants in any one video conference (depending on licensing). Sharing made easy – Screen share, present documents or show PowerPoint presentations at the click of a button. Meeting recording – One-button recording of your video conference with a download link emailed to you straight after your video conference. Why not make your meetings more time and cost-effective with video conferencing. Akita is a 3CX Platinum Partner. We can help get your organisation up and running with VoIP video, video conferencing and telephony. We can also supply you with the equipment you’ll need to get the most out of video calling and conferencing. For individual users, this range from webcams, to advanced VoIP phone handsets with in-built video display and camera. We can also provide solutions for meeting and boardrooms, including microphones and 360 degree cameras that activate based on who is speaking, through to high quality display screens and projectors. If you have a more specific requirement in mind, we’d also be happy to assist you. Please contact us. If you have any other questions about VoIP video calling or conferencing, please get in touch.